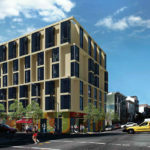 Having survived a parking related challenge, the plans for a nine-story building with 127 units of affordable housing to rise on the northern half of the parking lot parcel at the corner of Folsom and 17th Street, adjacent to the new In Chan Kaajal Park on the southern half of the lot, were formally approved back in 2017. And yesterday, the ceremonial ground breaking for “Casa Adelante,” as newly rendered for the Chinatown Community Development Center and Mission Economic Development Agency (MEDA) by Mithun and Y.A. Studio above, was held on-site at 2060 Folsom Street. 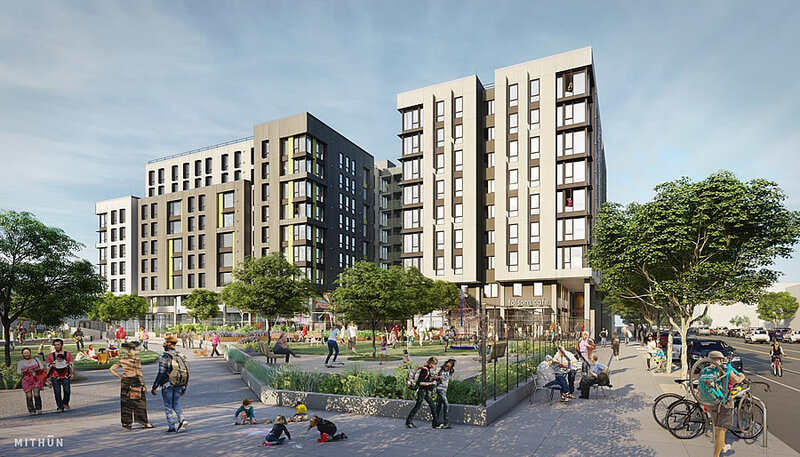 The development, which has been in the works since 2011, when the Mayor’s Office of Housing and Community Development purchased the site from the San Francisco Public Utilities Commission, should be ready for occupancy in late 2020. Wow…almost a decade later and that’s the best that can be done? Nine floors and 127 units with that design. This city is a joke! Keep in mind that the site was only zoned for building up to 55-feet in height when it was acquired by the MOHCD. That’s plenty of density; more than blocks you’d typically see in Barcelona, Paris, or Berlin. You’d b better off rooting for more development like this, not wasting time bemoaning a single development not being tall enough. The real issue is that it will have taken nearly a decade from when the city acquired the land for affordable housing to be built. The original poster was correct to bemoan the slow pace of producing new affordable units. And, Paris, Barcelona, and Berlin have plenty of equally tall & dense buildings, as well as several that are significantly taller and denser, but in any case, Barcelona and Paris are both considerably denser than San Francisco. As for Berlin, while it is reasonably dense, it covers a significantly larger area than SF, so it is probably not the best comparison (it is closer to LA in how it spreads out). ridiculous! 9 years! How much money was wasted in that amount of time!? Good point. Take that number and divide by 127 to see how much extra residents will pay for arguments over parking and other things. It looks a little upscale to me. Can MEDA make the windows smaller and change the exterior color to something less, um, yuppified? Like beige? What is the cost per foot for this project? Nobody builds “unaffordable” units for sale. This “affordable” BS, is just to hide the taint of SUBSIDIZED. all housing built is AFFORDABLE as you point out. Ask the spin doctors why they won’t label it, what it truly is. All housing is affordable to someone, but only a very limited amount of housing is subsidized by others (making them pay more than they normally would) so you have to pay less than 99% of the rest of the population. Pretty nice unearned privilege, if you can get on the very short list. Really just ripped the talking points right from Howard Jarvis and co didn’t you? Any home owner that takes the mortgage interest deduction is benefitting from subsidized housing. Get your facts straight. BTW, what is the corporate tax rate and top personal brackets in Spain and France, as long as we r emulating? The mayor is proposing a ballot initiative to allow 100% affordable housing to be constructed “as of right“. So if it passes, I guess this is the kind of project that would not take nine years in the future. 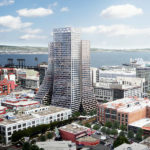 While “as of right” might sound great, the vast majority of projects in San Francisco seek a variance (or two) from code compliance, or in this case required a complete rezoning, challenges of which would still be permitted by law. And the passage of an “as of right” measure wouldn’t obviate the need for environmental reviews or block any such challenges. No balconies little outdoor space and rising sea water challenges in that part of the city… hope they considered a 🚠 approach to the building entry as a later phase or 🛶….. does look bland like most buildings that are “affordable” Mithun and YA are creative firms wish they got a little more playful with the shapes forms of the buildings and heights in this and future schemes and roof deck approach…. So now sea level rise is another reason to not build housing? I’m not sure how sea level rise figures in. Yes, it’s a bland design. And yes, it’s ridiculous that it takes nine years to build a very average apartment building in San Francisco. But sea level rise? I don’t see how that’s a reason to not building housing.